Who is ready to kick up their exercise routine to a whole new level? Do not wait until January 1st to make new resolutions. Make them today! IF you already exercise then consider stepping up and taking on a more intense workout routine. One way to kick up your routine is to try LES MILLS COMBAT. It is the first home-based Mixed Martial Arts inspired workout program combining a perfect blend of dynamic movements from six major Martial Arts disciplines. COMBAT includes high-intensity cardio and conditioning moves for the kind of muscle-shredding, calorie-burning workout that creates extreme body transformation. In just 60 days you'll look and feel like a lean, mean Mixed Martial Arts warrior. Did you read that? 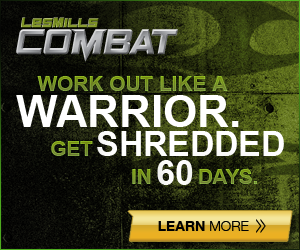 in just 60 days you can look and feel like a lean, mean MMA warrior! So by Christmas and heading into the New Year you could already be working out at your full potential. COMBAT is a program best suited for those who are already somewhat fit. There are modifier moves that lessen the impact, but the moves are intense with or without modification. Since COMBAT moves are synched to the beat of the music, it also appeals most to those who are comfortable with light choreography. There are no complicated dance moves, so both men and women equally enjoy punching and kicking to the beat of hit music. Men and women who are inspired by mixed martial arts. burn off their fat, and lean out their muscles. Moderately athletic people who wish to take their bodies to the next level. totally shredded in 60 days. If you are ready to take on this 60 Day Challenge consider the below opportunity. I am a BeachBody Coach and have a few of the below offers available. Message me at cafescrapper@gmail.com for more information or leave a comment below! Breaking news from my Upline Coach - This awesome kickboxing program, Combat, just went on sale. $140 for the Challenge Pack (fitness program and 30 days of Shakeology). BUT this week if you sign up as a coach (even if you do it for just the discount) I will get you $40 cash back so you will only pay $100 for the fitness program, 30 days of Shakeology and a business start up kit/websites, etc. This is the time to get started. In 2 months we will be slammed with New Years Resolution people. Get started now! *So if you were thinking of getting a month supply of Shakeology this is like getting the exercise program free plus a huge discount. This doesn't happen very often and won't last. If you do not want to sign up for a coach but ready to try out this program do message me because it is on sale for just a short time. If you are fairly new to exercise or want to get started, COMBAT might not be for you. I can help you find the best program to get you started today! 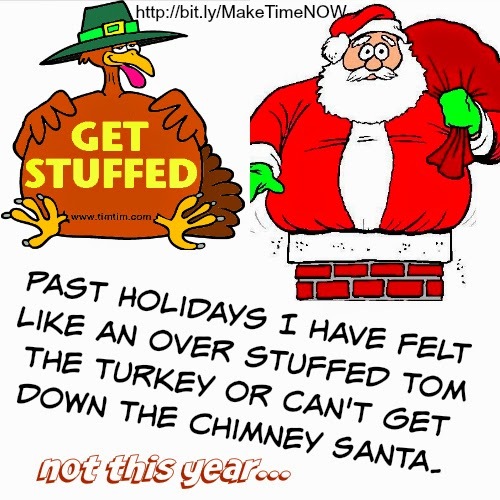 Don't wait until you feel over stuffed like Tom the Turkey or a Can't Fit Down the Chimney Santa to get moving and make some new healthier resolutions today. I can help you get on track and meet your new goals or resolutions! Here are my current free challenge groups. Make Time 4 Abs Challenge Group-Love this and it can be done when you first wake up in the morning. 21 Day Fix Challenge Group- Worth being a part of now! Make Time 4 Running Challenge Group - Just getting going!